Perhaps what Mayor Mike Bloomberg once said about the Atlantic Yards arena--“Nobody's going to remember how long it took, they're only going to look and see that it was done” --applies to the promises regarding the Yankee Stadium. 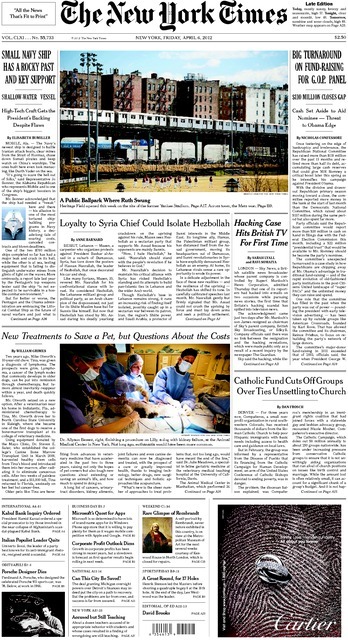 I wasn't the only person to notice something odd about the prominent and uniformly positive New York Times coverage today of the ballfields finally built to replace those lost for Yankee Stadium, A Public Park to Rival the Yankees’ Playground, complete with a front-page photo in both local and national editions. For those of you who've been wondering when the new public ballfields on the site of the original Yankee Stadium would finally be opening, well, here they are, only 16 months late, and nearly six years after the neighborhood's old ballfields were bulldozed to make way for the Yankees' new $2 billion stadium and parking garages. As the New York Daily News reports, "The new fields are open to local kids, but only when not under maintenance or being used by teams that buy permits." de Mause pointed out that the Times never covered "the actual debates over whether [to] build the Yankees' new stadium" that prominently. Remember the Yankees' dubious claim that they would move to New Jersey--away from their historic home and the city's media market--without sufficient subsidies and government help? The New York Times is in loooove with Heritage Field, the high-quality three-diamond spread in the footprint of the old Yankee Stadium, so much so that it merited above-the-fold placement on the front page. It is a lovely sight, but it is laden with the recent history of the city prioritizing the Yankee corporation over the kids in Highbridge and other nabes surrounding the stadium. ...I’ll admit, I have a pretty firm point of view on the democracy-ignoring deals regarding the new stadium, its impact on taxpayers and the community around it... But I think I’m looking at it with fairness and not bias when I say that in a story regarding a land use issue this big for the Bronx an interview or two with one of the prominent local activists or former community board members who opposed the stadium deal (they were ditched from CB4 by then-BP Adolfo Carrion, Jr.) would have been warranted. I'd agree. The Yankee Stadium controversy has gone down the memory hole. Is the Atlantic Yards controversy next? I don't think so. Remember "The Yankees" as a team, for better or worse, define New York; baseball fans were never up in arms about the way the city and the Yankees took the park land. Also, the people living around the stadium are poorer, had no real mouthpiece, no Daniel Goldstein to present to the public. Atlantic Yards, on the other hand, effects wealthier neighborhoods with more clout and access to media, also the Nets don't have any thing close to the history with the city that the Yankees have; they are really just a poor basketball team from New Jersey coming over. Also possible conflicts between patrons and neighborhood people might get more press. So I think that the battle over Atlantic Yards will be a stronger one. I don't disagree with you, Bob, but... to the extent that the Times steers elite opinion, the failure of the Times to take seriously the history of Yankee Stadium is glaring. And similar journalistic failures could steer opinion regarding Atlantic Yards. So the press has an important role in reminding the public of promises delayed, or unfulfilled. Significantly, the Times has never had a single reporter assigned to the Yankee Stadium controversy. (I first met Winnie Hu, who wrote Friday's puff piece, when she rushed into a city council hearing on the final stages of the deal and said to me and another reporter there, "I just got told to cover this - what's going on?") Norman, you'd know better than me, but didn't the Times have someone regular on the AY beat at least in the peak years once Lethem & Co. weighed in? Yes, from October 2005 through December 2006, Nicholas Confessore was assigned to the Brooklyn bureau, and had main--though not exclusive--responsibility for Atlantic Yards.